He worked in the family chicken business in Salisbury, Maryland, USA and took over from his father as President in 1952. At that time chickens were a commodity product, there were no brands, just supermarket chiller-cabinets full of frozen chickens. Now Frank Perdue’s chickens were different, they were fresh, “Freeze my chickens? I’d rather eat beef!” he once said. So in 1971 he started a series of ad campaigns starring himself which not only made him famous, it helped to transform the business from a turnover of $6 million a year to one of the biggest chicken-producing companies in the United States turning over $2.8 billion. 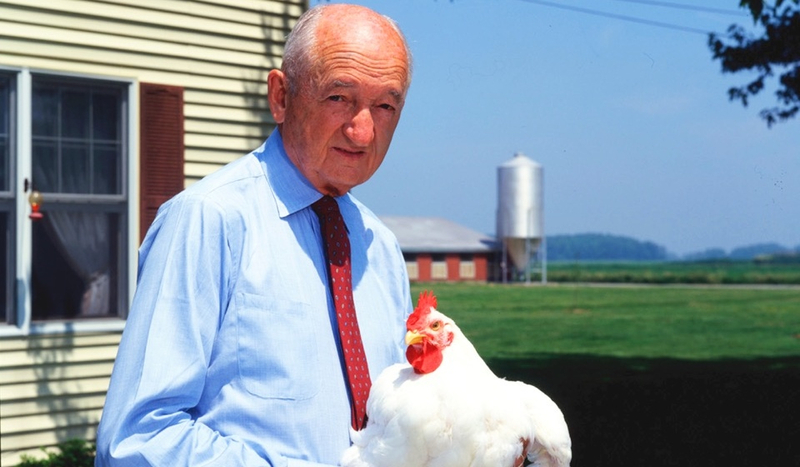 Frank Purdue transformed a commodity product into something unique, Perdue became the first branded chicken in America, he focused on quality, “Government standards would allow me to call this a Grade A chicken, but my standards wouldn’t. This chicken is skinny, it’s got scrapes, it’s got hairs. The fact is, my graders reject 30% of the chickens government graders accept as Grade A”. And he even had a guarantee, “If you’re not completely satisfied, write to me and I’ll give you your money back”. And his strapline, “It takes a tough man to make a tender chicken” became one of the most famous straplines ever. So if you’re fed up with skinny promotional products that’ve got scrapes and hairs, I could be your man. We’re obsessed with quality, we have a great guarantee, and just like Frank, we reject promotional products most of our competitors love to offer. If you’re looking for promotional products that will not only get your name in front of your customers but make them raging fans, then head to our contact page and type “Show me stuff that’ll blow my customers away!” and either me or one of my team will be in touch before you can say bwok, bwok (apparently chicken sound as a verb).